Despite this difficulty, progress made in the field of human sciences - especially anthropology and sociology - has contributed to the writing of a group of mysterious, bewildering, and thought-provoking texts on folk culture. If we consider the afore-mentioned methodology in the context of a number of schools of thought that address this type of culture, we will discover that it can be approached from several perspectives and in many ways. 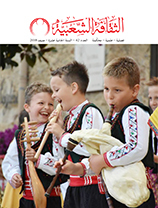 Sometimes folk culture reflects reactions to humiliation and authoritarian forces, as in the history of the Ghiwani song of Morocco. Sometimes, this heritage can be read as a type of marginal culture that uses new ways to express the community’s ideas, thoughts and traditions; this culture reflects society in the same way that elite culture reflects society. From people’s everyday lives, we can read the culture of the society as a whole, and analyse its past and future. Perhaps the most important conclusion of this study is that today there is a vast array of tools and approaches that can help when we study issues related to folk culture. We can request that doctoral dissertations be written about relevant topics, whether historical, sociological, linguistic, or purely religious. We could even establish a think tank of experts in the humanities to study the dark sides of folk culture, because the dark sides will more accurately reflect the complexity and diversity of the authentic culture of the Middle East and North Africa.